do you like our products? angiotensin converting enzyme (ACE) inhibitor. Description: White colour pills. Assumed disulfide characterizing odor. Composition: Active substance: Captopril - 12.5mg; 25 mg; 50mg. Aiding substance: lactose, starch, calcium or magnesium stearate, talc. Pharmacotherapeutic group: angiotensin converting enzyme (ACE) inhibitor. Captopril suppresses formation from angiotensin I and angiotensin II, reduces aldosterone generation in adrenal gland. It lowers arterial pressure by blood vessels widening action, reduces total impedance of peripheral blood vessels, pre and post stress on myocardium. Improves blood circulation in coronary vessels and kidneys. Direct action unlike vasodilator (Hydralazine, Minoxidil and etc.). Captopril operation doesn’t accompany reflex tachycardia and doesn’t cause oxygen demand reduction by myocardium. In case of long application Captopril reduces expressiveness of hypertrophy of myocardium and resistive type arteries walls, improves myocardium blood supply, reduces aggregation of platelets. "Captopril Neo" is well combined with other antihypertensive drugs. Unlike other vasodilator, doesn't cause water delay. At certain forms of hypertension (renovascular hypertension and other forms of rheno- hypertension), Captopril is one of the main medicine. After peroral intake Captopril is quickly absorbed from the gastrointestinal tract. Bioavailability makes up 60-70%. Intake together with food, reduces bioavailability approximately 30-40%, but doesn’t influence on antihypertensive effect. Effect begins after 30 minutes from intake, but maximum effect is reached in 1-2 hours. Metabolizes in the liver. 95% of Captopril is excreted by kidneys, from here 40-50% - unchanged, the rested –as metabolites. • Arterial hypertension (including renovascular). • Heart chronic insufficiency (involved in chronic therapy). • Heart ischemic disease (the left ventricle function disorder, after transferred cardiac infarction in clinically stable patients). • Diabetic nephropathy on the background of I stage of diabetes mellitus (when albuminuria is high 30mg in a day). • Hypersensitivity toward Captopril and angiotensin converting enzyme (ACE) inhibitor. • Quincke's edema (anamnesis, on the background of ACE inhibitor or hereditary). • Liver and kidney function expressed disorder, azotemia, hyperpotassemia, kidney arteries’ bilateral, or unilateral stenosis with progressive zotemia. • Aorta valve stenosis, other stonewalling, preventing from blood flow from the left ventricle of heart. • Pregnancy and lactation period. • Children up to 18 age. "Captopril Neo" is prescribed for peroral intake, in 1 hour prior to meal. The mode of dosage is established individually. At time of arterial hypertension: the preparation is prescribed with the initial dose 12,5 mg 2 times in a day. In case of need the dose increases gradually (with an interval of 2-4 weeks) before achieving of optimum effect. At slight and moderate arterial hypertension the initial dose makes 12,5 mg 2 times per day (in case of need the dose increases in each 2-4 weeks), maintaining dose is 25 mg 2 times per day, the maximum dose – 25 mg 2 times per day. At heavy arterial hypertension the initial dose makes up 12,5 mg 2 times per day. The dose is increased gradually up to 50 mg by 3 times per day. The maximum daily dose makes 150 mg.
At time of heart insufficiency treatment: "Captopril Neo" is prescribed in that case when diuretic usage doesn't cause appropriate effect. The initial dose is 6,25mg 3 times in a day. In case of need the dose gradually increases (with an interval of 2-4 weeks). Maintaining dose is 25 mg 2-3 times per day, the maximum dose – 50 mg 3 times per day. At time of left ventricle function disorder: It is possible to intake preparation after three days from myocardial infarction transfer. The initial dose is 6,25mg 3 times per day, the dose is increased gradually (with an interval of 2-4 weeks) up to 25 mg 2-3 times per day. In case of need, dose is increased gradually up to the maximum daily dose – 50 mg 3 times per day. At moderately expressed disorder (clearance of Creatinine not less than 30 ml/min. / 1,73 m2) "Captopril Neo" can be prescribed with following dose of 75-100 mg/in a day. At more expressed disorder of kidneys function (clearance of Creatinine less than 30 ml/min./ 1,73 m2) the initial dose makes up not more than 12,5 mg/in a day. For further necessity, dose of "Captopril Neo" is increased gradually with quite long intervals, but there is used less usual dose of preparation. For elderly patients dose of Captopril is selected individually. 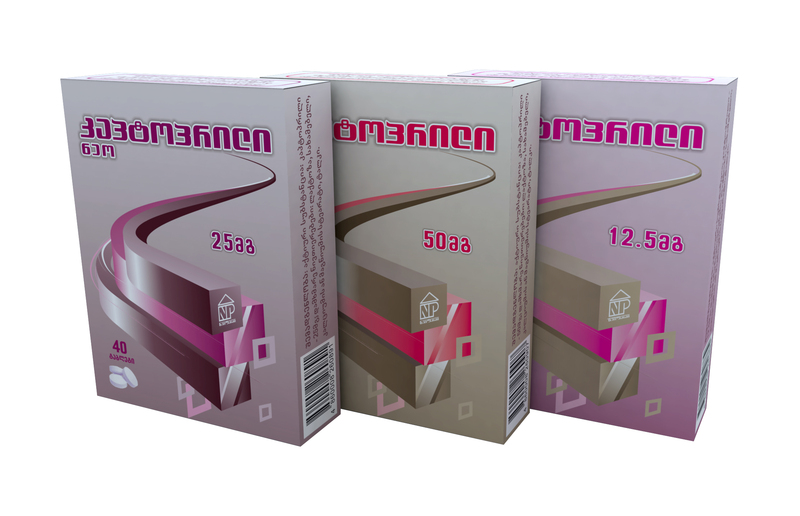 It is recommended to begin therapy from 6,25 mg 2 times per day and then maintaining dose with smallest effective dose. In case of dose skipping intake of double dose isn't allowed. • Dry mouth, nausea, vomiting, aphthous stomatitis, abdominal pain, diarrhea or constipation, cholestasis. • Headache, dizziness, sleep disturbance. • Increase of potassium level in the blood serum, proteinuria. At time of heart chronic insufficiency the preparation is used under the conditions of medical supervision. "Captopril Neo" is prescribed carefully for patients with collagenous (because of danger of development agranulocytosis and granulopenia). "Captopril Neo" is prescribed carefully on the background of treatment by allopurinol or procaineamide hydrochloride, also on the background of treatment by immunosuppressants (Azathioprine, Cyclophosphamide), especially patients with kidneys function disorder. Prior to treatment and in the course of treatment by "Captopril Neo" it is necessary to control kidney function, especially among patients with kidneys function disorder as the risk of proteinuria development increases. In such cases, during the first 9 month of treatment it is necessary to control urine protein content monthly. If protein level in urine exceeds 1 g/in a day, it is desirable to stop treatment by Captopril. In case of development of arterial hypotension after use of "Captopril Neo", the patient has to lie down. In case of expressed hypotension the positive effect comes at intravenous introduction of isotonic solution of sodium chlorides. Possibility of development of arterial hypotension in the course of treatment may be decreased, if we stop reception of diuretics prior to treatment 4-7 days by "Captopril-Neo" or reduce their dose considerably. In case of development of angioneurotic edema, it is necessary to stop reception of preparation and to carry out appropriate medical supervision. If edema is localized on the face, there is no need of special treatment, it is possible to use antihistamine. If edema spreads on the tongue, gullet and larynx and if there is a risk of obstruction of respiratory ways, it is necessary to introduce adrenaline subcutaneous (with dilution of 0,5 ml on 1:1000). During treatment it is recommended to stop reception of alcoholic drinks. Use in pregnancy and lactation period: Preparation isn’t used in the period of pregnancy and lactation. Influence of vehicle and mechanisms management: After intake of “Captopril Neo” it is necessary to be carefully at time of driving auto vehicle and mechanisms which need attention concentration and quick psychomotor action, because there is possibility to develop such reactions that may cause distractibility. Overdose: Symptoms: expressed arterial hypotension. Treatment: intravenous introduction of isotonic solution of sodium chlorides or other plasma containing solutions, hemodialysis. Interaction with other therapeutic agents: Hypotensive effect "Captopril Neo" reinforces when using together with diuretics, ganglionic blocker, adrenoceptor antagonist. At simultaneous intake together with indometacin, clonidine weakening of hypotensive effect can be noted. At simultaneous intake together with potassium-sparing diuretic or potassium preparations there may develop hyperpotassemia. Usage of "Captopril Neo" by those patients who intake allopurinol or procaineamide hydrochloride, increases the risk of development of hypogranulocytosis or Stevens-Johnson syndrome. Simultaneous intake together with immunosuppressants increases risk of development of hematologic disorder. At simultaneous intake together with probenecid, elimination of "Captopril Neo"’ together with urine decreases. At simultaneous use together with lithium salts there is possibility to increase concentration of lithium in blood serum. Pharmaceutical product group II, issued with a prescription form #3 (in case of emergency help the drug is issued without prescription). Storage conditions: Store on 15-25ºC temperature in a dark, dry place and keep away from children. In case of visual defects and expiry of validity date, the preparation can not be used. Package: Primary package: 20 tablets on polyvinyl chloride blister. Secondary package: 2 blister in the box.